Baked Apples with Oatmeal is a cross between good old baked apples and an apple crisp. I didn’t use any flour, brown sugar, or tons of butter. Instead I used maple syrup to sweeten as a dessert, plus it gives this a great flavor with the apples and orange zest, so yummy! I wanted something warming and sweet but healthier too, which was really the most important for me on this recipe. I like to eat desserts as we all know but lightening them up and still satiating that want is exactly what I got out of the recipe. 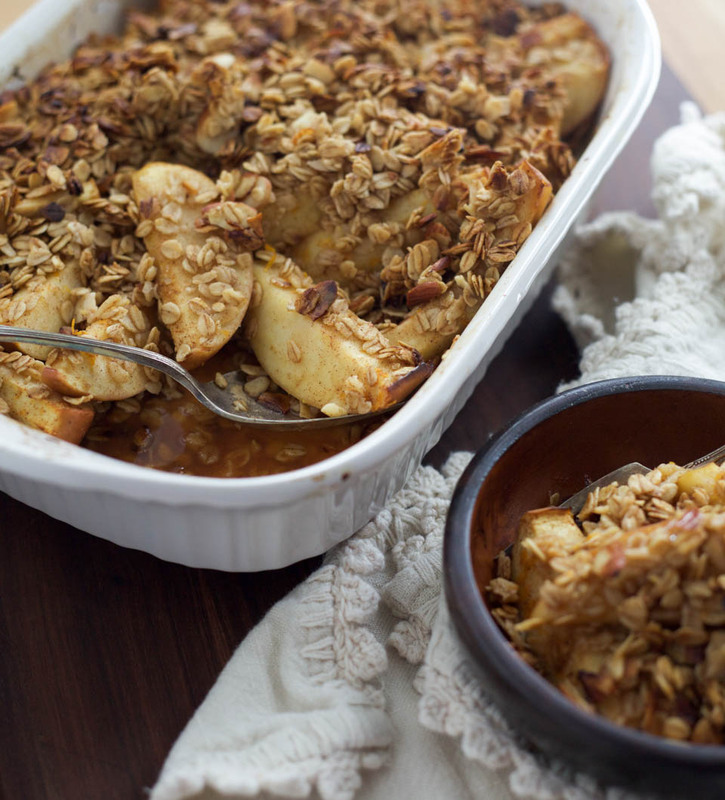 I have also been craving oats and there were apples on our counter, so I started playing around and came to this sweet treat. The apples are gloriously cooked down to a tender texture, mixed in with bright orange zest and juice. Plus the comforting flavor and aroma of cinnamon is always good in the Winter. 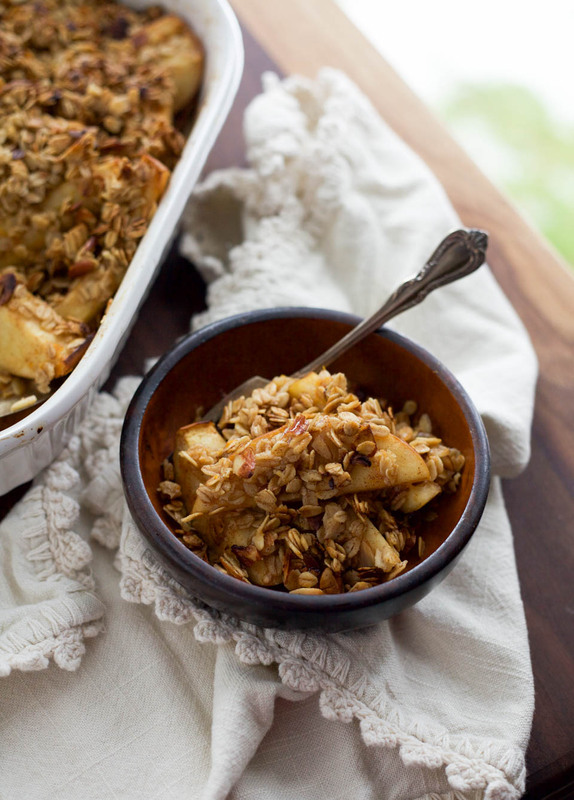 The topping was a take on my granola recipe with almonds for more texture and nutrients. All in all I love how this simple and easy sweet treat came about and everyone loved it too. Win! You can make this a touch more indulgent by adding some ice cream or whipped cream to serve. Or to stay with the healthier version add some Greek yogurt or Labneh, which is tangy and the perfect balance to go with the sweetness of the apples. Either way this is a great dessert! 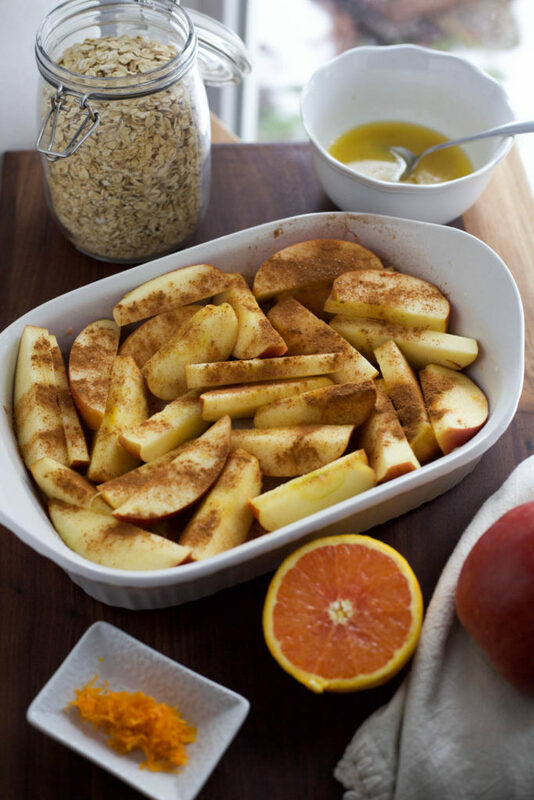 Combine sliced apples, orange zest, orange juice, 1 tablespoon maple syrup, 1 teaspoon cinnamon, 1/4 teaspoon salt in an 8×10 baking dish or 10inch cast iron skillet, toss together to combine well. Combine melted butter, 2 tablespoons maple syrup, and vanilla extract in a small bowl, use a fork and mix to combine. In a medium bowl combine oats, almonds, 1 teaspoon cinnamon, and 1/4 teaspoon salt, mix to combine well. Add melted butter to oats, use a spatula to combine very well. 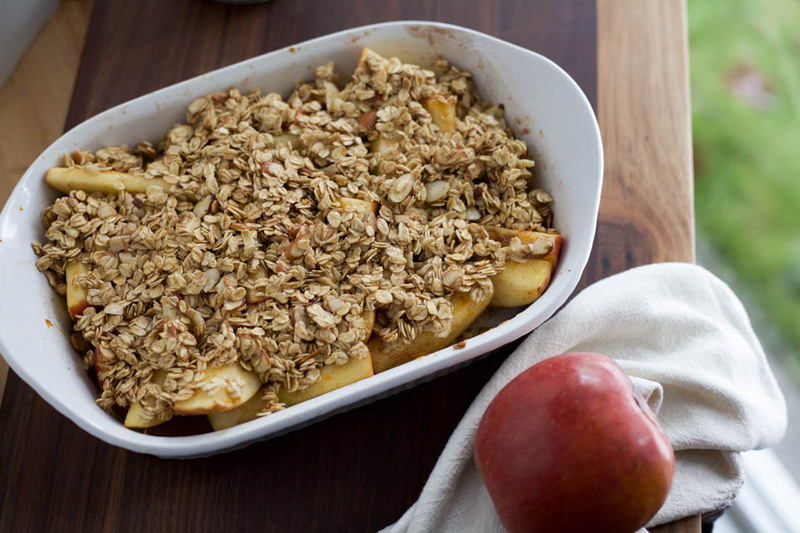 Sprinkle oats mixture to the top of the apples evenly. 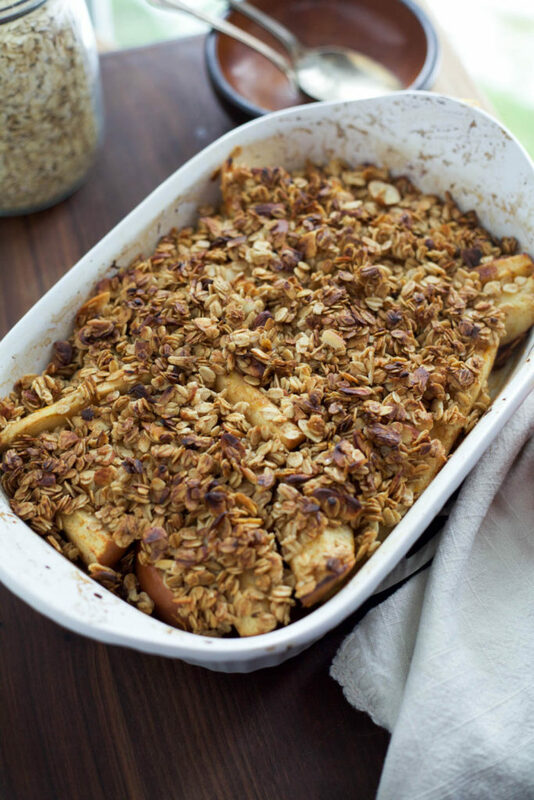 Place baking pan in oven for 40 minutes or until the granola topping is golden crispy brown but not burnt. Remove and serve immediately. Store leftovers on counter for up to 1 day. Less indulgent added toppings: plain yogurt, labneh, or creme fraiche. Indulgent added toppings: ice cream or whipped cream. Woah this is amazing!! All of my favourite things in one dish; I so need to make this! This might be dessert but I would totally eat this for breakfast!! Awesome idea! Ooooh with some coffee, yum. So cold here: perfect comfort food suggestion. Thank you !